The instrument at the centre of the West End musicians' dispute is sophisticated enough to replicate the sound and feel of a real orchestra, according to its makers. Using digital sample technology, it can follow a conductor's tempo and musical nuance during live performance. Its manufacturers, New York-based Realtime Music Solutions (RMS), proudly hail the Sinfonia as the best example of its kind in the world. But even the company itself does not endorse using it as a replacement for a group of skilled musicians. "Nothing sounds as good as a full orchestra," the company says on its website, adding: "We recommend using as many live players as possible." 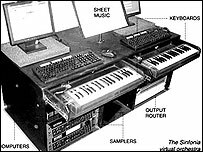 It says Sinfonia was developed to improve on the sound of traditional synthesisers, using specific samples for each note, depending on the articulation and style needed. The Sinfonia performer follows the conductor just like the other musicians, while the director conducts naturally. It was made "to be used in conjunction with live musicians when a full orchestra is not possible, whether due to pit size, budget constraints, or lack of available musicians". At the heart of the West End row are plans to use a Sinfonia to replace 12 members of the orchestra when Les Miserables moves from the Palace Theatre to the smaller Queens Theatre. The pit size at the Queens is at the crux of the problem, and the Musicians' Union says it does not object to the use of digital sample-based technology in itself. 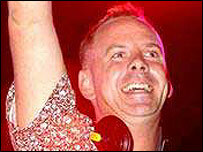 The union includes in its fold well-known dance artists such as Norman Cook - better known as Fatboy Slim - and Paul Oakenfold, who have built careers out of music made using digital recording software. 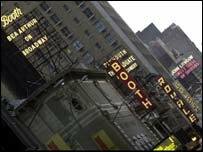 "Instruments are tools that do their jobs , but the West End theatre is built on top class productions of a live nature," said a Musicians' Union spokesman. "We have got very highly-skilled, highly-trained musicians, and a machine is a machine. The issue here is that a piece of machinery is being used to replace 12 musicians." Manufacturer RMS insists it has "a strong philosophical commitment to the theatrical tradition and the process by which technology is carefully integrated into the performing arts". It also claims to have "identified and solved a myriad of musical, acoustical, technical, and procedural problems indigenous to the live performing arts". Warp Records, one of the UK's leading electronic music labels, said some theatre customers would be hard pressed to tell the difference between the Sinfonia and the real thing. "Almost all our artists use those sample sounds and to most people's ears they are pretty much as good as the instruments," said Warp's Greg Eden.